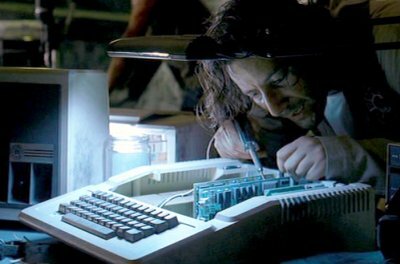 The Apple is in the Swan research laboratory and it is required that a sequence of numbers be entered on it every 108 minutes. 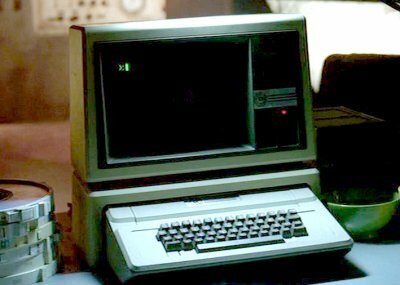 The machine is of the right era for the Dharma Initiative, but the Apple II keyboard does not have an EXECUTE key that is so prominent here. They also appear to switch on the machine using the monitor's power button. Nice shots of the Apple with the lid off, here! Monitor ///'s were sold with Apple ]['s and the earliest //e's at the time - in the top picture they're even using the stand Apple made and sold to support the monitor over the ][-style case. Agreed. Back in 1980 the Monitor /// (the *only* display Apple manufactured at the time) was commonly bundled with the Apple III and Apple II Plus. The optional stand allowed it to fit properly atop the Apple II's more narrow case. It was standard to find Monitor III's sold with Apple IIe's as well, right up until 1984. That is, until the Apple II got its own monochrome display: the Monitor II. The text display was not a real Apple II as far as I could tell, it was simulated (or coming from another source?). Not too mention the Monitor /// had such an incredibly slow phosphor refresh rate everything ghosted like you wouldn't believe. 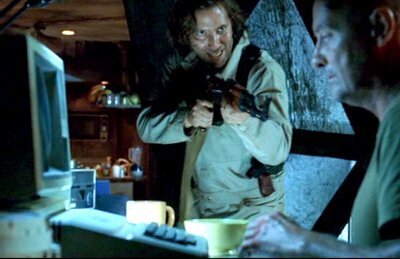 :) Later episodes of Lost got less accurate. At one point they had an ImageWriter II shown in the late 70's timeline period of Dharma. In actuality, that printer wasn't introduced until 1985! I've fixed the comment about the Monitor ///. Thanks.